Ina Garten’s Turkey Meatloaf and Parmesan Smashed Potatoes: The ultimate level of comfort food with a tender and moist meatloaf and the best mashed potatoes ever! I know it’s still summer. I know that meat is still being grilled and pool parties are still occurring. But frankly, I’m ready for fall! I’m ready for cool, crisp weather. And for the leaves to start changing. And of course for all of the comfort foods associated with the fall and winter. That’s why I chose, in the middle of August, to make Ina Garten’s turkey meatloaf and parmesan smashed potatoes as part of my Week with the Barefoot Contessa. Comfort food enthusiasts, don’t even think about turning your nose up at the fact that this is a turkey meatloaf. If my beef-loving husband didn’t know I was making a turkey meatloaf in advance, I could have totally passed this off as a meatloaf mixture recipe! I totally expected him to balk at this recipe and turn up his nose. But being that just about every single Ina recipe that I’ve made has been a complete success, I think he’s learning to trust the recipes as much as I am. And that’s a success story in and of itself! My friend Jen was actually the one who encouraged me to make this recipe as we were pouring over some of Ina’s cookbooks a few weeks ago, all giddy about sharing recipes we’ve already made and getting excited to try out new ones. Once I heard that her husband loved this recipe, I knew that Kyle would too. In my eyes, if you’re going to make Ina’s turkey meatloaf in the middle of the summer, you have to go all out and make mashed potatoes on the side. Ina’s parmesan mashed potatoes was another recipe that Jen highly recommended so this side was a no-brainer for this meal. Thanks Jen!! And we weren’t let down! Both of these recipes were fantastic! 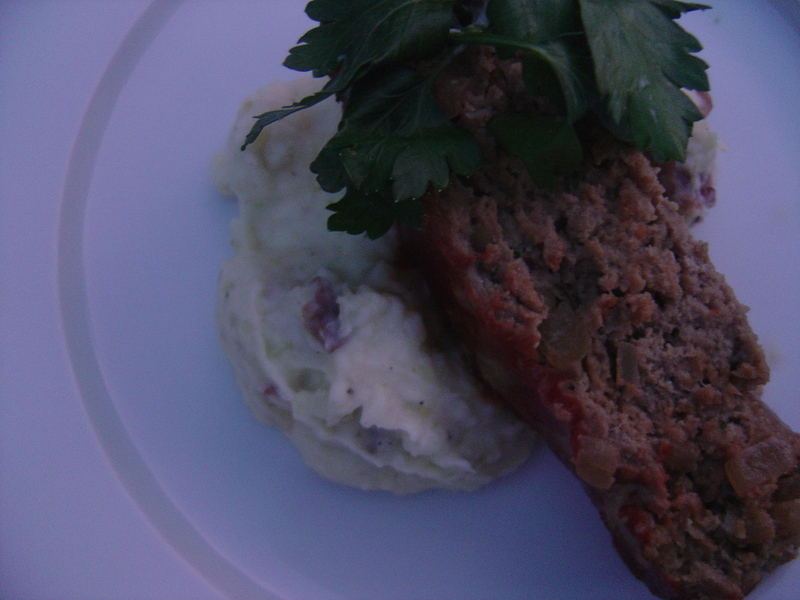 The meatloaf was moist and so incredibly flavorful that you cannot tell it’s turkey meat. Amazing. This was seriously the best meatloaf I’ve ever made and I even got “2 thumbs up” from Kyle, the meatloaf critic. The meatloaf recipe makes a TON of meatloaf. OK, maybe not a literal TON, but it will certain feed a large crowd. I cut the meatloaf recipe down by two-thirds (5lbs of ground turkey? Really??) and there was plenty of meatloaf for the 2 of us and a fair amount of leftovers too. It’s an easy recipe to scale down, especially most of the ingredient amounts can quickly be divided by 3. The full recipe will easily serve 8 to 10 people. The scaled down version will serve 4 to 6 people. The parmesan mashed potatoes were delish and perfectly buttery! Just the way mashed potatoes should be! The Parmesan cheese flavor really comes through since there aren’t many other flavors competing with it. I also cut this recipe half since we surely don’t need 3 pounds of mashed potatoes in my house. Seriously, is there no better answer to the question of what to serve with meatloaf than these parmesan smashed potatoes? BUT! If you’re looking for a little freshening up of your side dishes, let me suggest my creamy fresh herb mashed potatoes, steakhouse creamed spinach with crispy shallots, or my insanely delicious from scratch creamed corn recipe, or these cheesy hasselback potatoes. Any of those recipes would also be perfect served with this meatloaf! Ina Garten's turkey meatloaf is a delicious and cozy meal that's so great, you'll forget you're eating ground turkey! 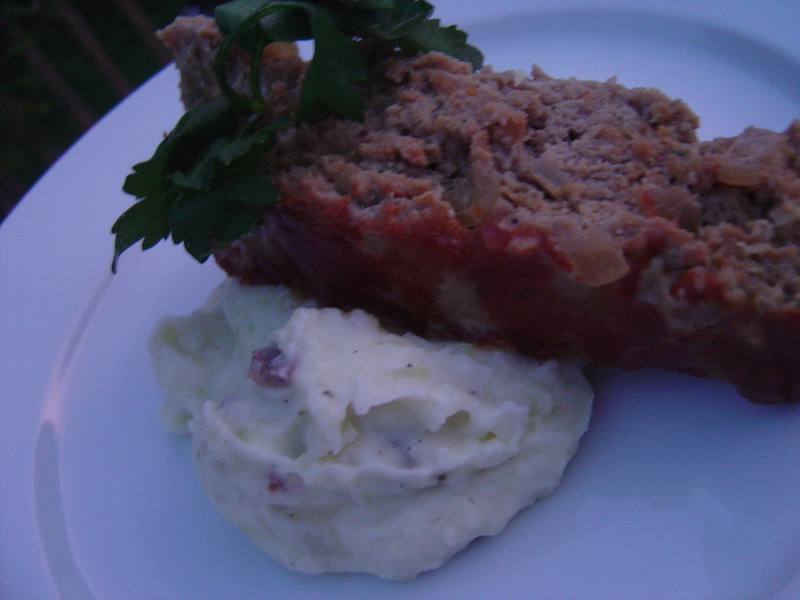 The recipe below makes A LOT of meatloaf but it can be easily scaled down by two-thirds. Bake the smaller meatloaf for 1 hour and check the internal temperature - it will read 160° F when finished. Combine the ground turkey, bread crumbs, eggs, and onion mixture in a large bowl. Mix well and shape into a rectangular loaf on an ungreased sheet pan. Spread the ketchup evenly on top. Bake for 1 ½ hours until the internal temperature is 160° F and the meatloaf is cooked through. (A pan of hot water in the oven under the meatloaf will keep the top from cracking.) Serve hot, at room temperature, or cold on a sandwich. Parmesan smashed potatoes are the best side dish for turkey meatloaf! No gravy is needed for these potatoes since they're full of cheesy flavor, butter, and sour cream. Place the potatoes and 1 tablespoon of salt in a 4-quart saucepan and add cold water to cover (water should be about 1-inch above the top of the potatoes). Bring to a boil, lower the heat and simmer partially covered for about 20 minutes, until completely tender. Drain. In an electric mixer with paddle attachment, mix the potatoes for a few seconds to break them up. In a small saucepan, heat the half-and-half and butter. Add them slowly to the potatoes, mixing on the lowest speed. The last quarter of the cream should be folded in by hand. Fold in the sour cream, Parmesan, 2 teaspoons salt, and pepper and serve immediately. I am totally ready for fall too! My hubby loves meatloaf so I’ll be interested to see what he thinks of this version. It’s Ina’s so I know it has to be good! Thanks for posting. Thatboy was a little hesitant of turkey meatloaf, until he tried it. Now when his parents snub their nose he gets insistent that it’s better than beef. Well, if you can pass this off on your hubby then I have to be able to as well. I’ve snuck tofu under his nose and he never knew the difference. This meatloaf looks so tasty. Who was your grandmother ??? pure heaven ! Just thinking of her store and cases filled to the brim with truly, all cooked on premises luscious comfort food -well it makes my mouth water!!! Oh that is my FAVE meatloaf recipe ever!!! I always serve it with mashed potatoes. The meatloaf is awesome the next day – cold, in meatloaf sandwiches. So good. Did you only cut the meat by 2/3’s or the entire recipe? Tiffany: No, I cut the whole recipe by 2/3s.